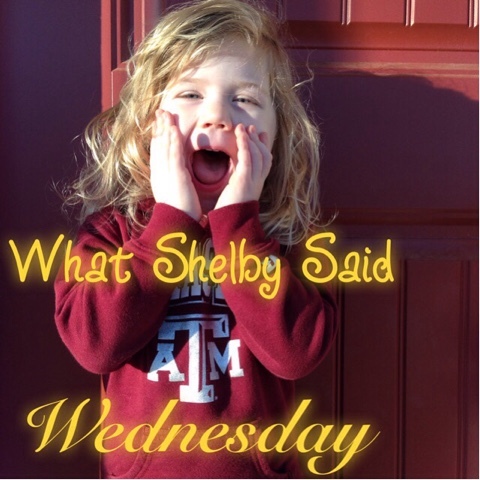 Amanda M. Schreiner: What Shelby Said Wednesday - Do I Look OK? Shelby had a rough weekend. Saturday afternoon, after a morning spent with Daddy all to herself, we were having lunch on our front porch. In a seemingly unfair turn of events, Shelby took a fall sweetly trying to avoid plowing over baby sister Victoria. She landed face first on a (stupid, poorly designed, misplaced, I-mean-who-puts-planters-by-the-front-door?) pot. I'm not going to describe the sound. There were blood and tears. Calm directions from former-paramedic Daddy to frantic scrambling Mommy. Phone calls to retired Air Force dentist/prothsodontist Grandpa (praise God right next door). Eventually calm returned and Tylenol was administered with plans to visit the pediatric dentist (did I ever tell you? We've been there before - Victoria cracked a tooth on our concrete floor and had to have it pulled a few months after her first birthday last year) on Monday morning. Shelby went down to a delayed nap. When she woke up, she asked Tim: "Do I look ok?" Oh my heart. We've tried not to let our focus be on looks. We know the day and age our dearest daughters were born into. We haven't gone as far as to never tell them how pretty they are, but we try to outdo our adoration of hair and eyes with calling their attention to their beautiful hearts. Their sweet spirits. Their intelligence. The funny ways they entertain their families and themselves and the way they twinkle all over when they laugh. We haven't gone as far as to take the advice to never tell them they are pretty, because some day some BOY will come along. I don't want them to fall head over heals for the first person willing to point that fact out to them in so many words. They need to hear that from us; especially their Daddy. The fact is no matter how much we have tried to protect her, there it is. How do I look? Am I damaged? She was sneaking glances in the mirror and even covered her mouth the first few times she smiled afterward. Sweet Shelby, never ever every cover that smile! You can't contain it because it is real. It is genuine and I pray nothing takes it away. We did go to the dentist Monday and they took an X-Ray ... We go back in a month to make sure the teeth are making their way back down but there were no breaks or cracks and no permanent teeth were harmed! Praise God! She's already healing, the swelling is all but gone and her teeth are even looking more normal. Amazing. It's like He designed kids to be able to absorb a few accidents.